A highly controversial natural food substance, carrageenan, a seaweed derivative used in conventional, “natural,” and some organic foods, was just reapproved by USDA Secretary Sonny Perdue. This move overrides the recommendation of the National Organic Standards Board, an expert industry panel set up by Congress. After hearing from medical and scientific experts describing carrageenan’s link to intestinal inflammation, cancer, and other human health risks, the NOSB voted to remove carrageenan from the list of approved synthetic and non-organic substances for use in organic food production. 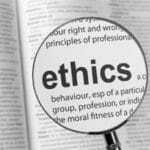 In a move unprecedented during the last quarter century of organic industry rulemaking, the USDA ignored the NOSB vote in the Federal Register without an opportunity for the public to comment on their decision before it goes into effect. “This is the latest instance of the Trump/Purdue administration siding with powerful agribusiness interests. They are running roughshod over the will of Congress that established the NOSB as a buffer to insulate organic regulations from corrupt corporate lobbyists,” said Mark A. Kastel, Senior Farm Policy Analyst at The Cornucopia Institute, a Wisconsin-based nonprofit that acts as an organic industry watchdog. A report issued in 2016 by The Cornucopia Institute summarized research on carrageenan, exposing the industry’s hidden data demonstrating that all food-grade carrageenan contains a carcinogenic contaminant—low molecular weight poligeenan. Carrageenan, harvested from specific species of red seaweed, is a highly effective thickener/stabilizer found in processed foods including infant formula, plant-based beverages, deli meats, and some dairy products, such as ice cream. The controversy over carrageenan has existed between food industry representatives and public health researchers for decades, but it has flared up again over the past few years with its use in organic food. 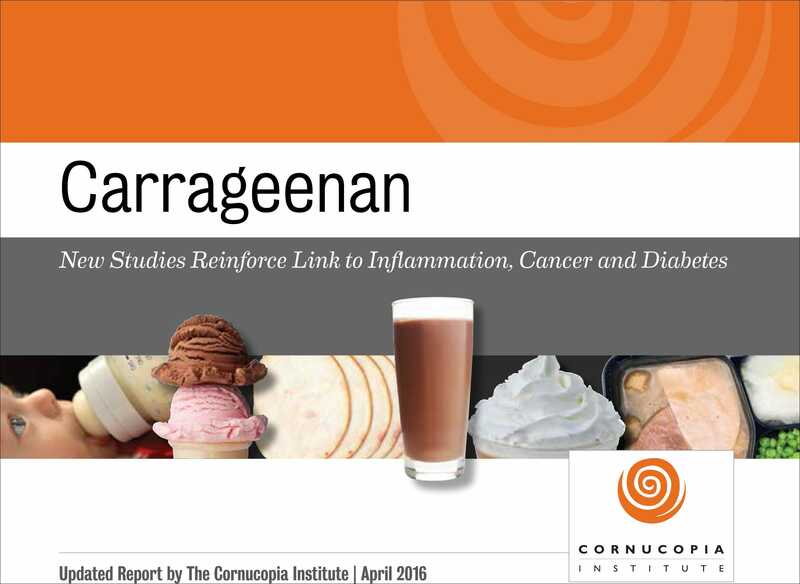 Cornucopia’s report, Carrageenan: New Studies Reinforce Link to Inflammation, Cancer, and Diabetes, was formally submitted to the NOSB before a supermajority of the board voted to remove carrageenan from use in organic food in 2016. Ironically, the organic industry is way out ahead of the USDA policymakers, having removed the substance from products due to consumer feedback. The Cornucopia Institute’s report and web-based buyers guide show which organic brands have been reformulated without carrageenan or have never included it. “Iconic brands in the organic industry, like Organic Valley, Stonyfield, and Eden Foods, all looked at the research, listened to the concerns of their customers, and purged carrageenan from their products,” stated Dr. Linley Dixon, Senior Scientist at The Cornucopia Institute. This is the second time in the almost three-decades-long organic rulemaking process (both during the nascent Trump administration), that the USDA has overruled the NOSB in making sunset recommendations. The NOSB, according to their congressional mandate, evaluates materials in terms of their impact on the environment, human health, and essentiality in organic food production. “The USDA has violated the public’s trust in the USDA organic label, and will continue to undermine the value of the label in the market as long as it ignores the legal authority of the NOSB, and of public process, to establish the National List of Allowed and Prohibited Substances,” said Jay Feldman, Executive Director of Beyond Pesticides and a former member of the NOSB. In their report, Cornucopia, a farm policy research group, made available the full set of data that was originally published online 10 years ago by the Marinalg Working Group, a carrageenan industry trade-lobby group. The data showed widespread contamination of food-grade carrageenan with poligeenan, an intestinal inflammatory agent that leads to cancer. Marinalg had posted the illuminating research on its website, but later removed it, and has since aggressively lobbied food safety regulators for continued approval of the use of carrageenan in food. “This type of subterfuge by powerful agribusiness might have been successful at the FDA, or before European regulators, but the NOSB, carrying out the mandate of the U.S. Congress, weighed current evidence and voted to protect organic consumers by banning this dangerous material,” stated Cornucopia’s Kastel. The “smoking gun” data was originally published to meet the demands of a 2005 European Commission recommendation that no more than five percent of food-grade carrageenan fractions should have a molecular weight below 50 kD, due to the published, peer-reviewed, health research associating the contamination with inflammation and tumor formation. The carrageenan industry, funding its own research, has long claimed that food-grade carrageenan and poligeenan (a known carcinogen) are two distinctly different substances. The industry still denies that food-grade carrageenan contains poligeenan, however, their own data and the publicly funded scientific research has shown otherwise. “Just like with the USDA’s lack of enforcement of ‘factory farms’ producing eggs, dairy, and meat labeled organic or its allowance of soil-less/hydroponic production for organic vegetables, consumers, regrettably, need to do their own research over and above looking for the organic seal,” affirmed Kastel. “The hidden industry data we discovered revealed that all 12 food-grade carrageenan samples tested did, in fact, contain poligeenan in varying quantities of up to 25%,” said Linley Dixon, PhD, Cornucopia’s Senior Staff Scientist. Carrageenan is such an efficient inflammatory agent and carcinogen, it is widely used with laboratory animals to study the molecular signals involved in cancer and anti-inflammatory drugs. Publicly funded researchers have published dozens of studies on the harmful health effects of consuming food-grade carrageenan, but the industry has aggressively responded by funding its own studies, many of which Cornucopia critiques in its report. Research has shown that besides the initial contamination in food-grade carrageenan, stomach acid in the human digestive tract can convert a percentage of carrageenan that may otherwise be safe into the most dangerous, carcinogenic form. Tobacman’s findings, along with others in her field, demonstrate the molecular mechanism by which food-grade carrageenan causes inflammation, cancer, insulin resistance, and an immunogenic response in humans. Cornucopia’s report details many flaws in some of the industry-funded studies used by the Joint Expert Committee on Food Additives (JECFA) as justification for the continued use of carrageenan in food. In addition, the report provides a rebuttal to the industry’s critique of publicly funded research (the majority of U.S. studies were funded by the National Institute of Health). Through experimentation, many people have discovered a correlation between carrageenan in their diets and a myriad of symptoms such as diarrhea, irritable bowel syndrome, more serious inflammatory bowel disease, and colitis. For many, when carrageenan is removed from the diet, symptoms quickly dissipate. 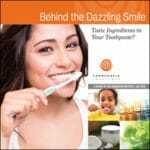 Even some toothpaste brands have shunned the use of carrageenan (covered in Cornucopia’s toothpaste buyers guide to empower consumers and wholesale buyers). “When the CEO of the iconic Dr. Bronner’s brand became aware of the research on carrageenan, their CEO, David Bronner, researched the alternatives and found that xanthan gum performed just as well in their toothpaste,” Kastel said. Dr. Bronner’s, known for its line of soaps along with other body care and food products, is a prominent leader in the fight to maintain organic standards and advocate for GMO labeling. “Armed with the organic brand guide to carrageenan, consumers can make sure they are protecting their families while simultaneously rewarding the true heroes in the organic industry,” Kastel added. Trump/Perdue Draining the Swamp at the USDA? Why Should Organics Be Different?